• Australian Cattle Dog breeders are listed below alphabetically by State / city. • Click on underlined words to find Australian Cattle Dog puppies for sale. This breed is also known as Blue Heeler. • Please tell the Australian Cattle Dog breeders with puppies for sale that you found them on BreedersClub.net. The Australian Cattle Dog is a livestock herding breed with a great deal of energy requiring lots of activity. They are easily trained, love to play, and make fine watchdog and protection dogs. They are medium sized, very smart, tends to herd children and are also known by the names Queensland heeler, Blue Heeler, Hall's heeler. 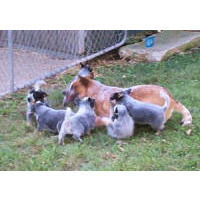 I am a farmer raising quality AKC registered working stock for families looking for a companion. They are very well associated with people and livestock. They are wormed and had vaccinations. They enjoy the outdoors. Good around kids. I have been raising quality AKC dogs for well over 25 years. Many repeat customer. I have been a breeders club member since 2008. I do shipping at new owners expense. This breed directory page features Australian Cattle Dogs breeders with puppies and/or adult dogs for sale. Once you purchase your new found friend, you will want to provide it the best in pet health care. Be sure to visit our online discount pet supplies catalog and order NuVet Plus™ to keep your puppy and adult dogs in top condition. The discount catalog also features collars, leashes, carriers, general pet care products and much more. BreedersClub.net does not pre-screen the Australian Cattle Dogs breeders who advertise their puppies and dogs for sale in the BreedersClub.net breeder directory and in the classified ads. We require all advertisers to agree to our advertising terms. You should ask the Australian Cattle Dogs breeders you talk with for references from past buyers and veterinarians.